I read somewhere you couldn't use a star wars head. 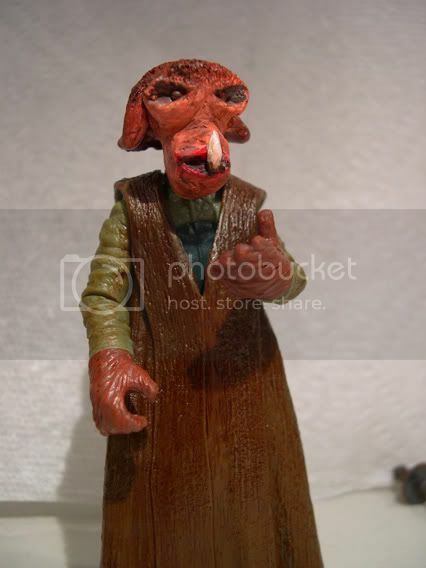 Thats where i got confused, i can sculpt an alien and not use an existing SW head, but can it be a star wars species, or does it need to be my creation? 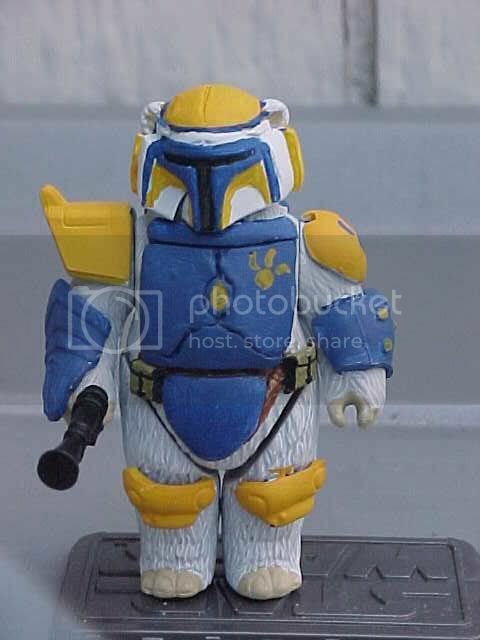 I was under the understanding that you just can't make any spieces Hasbro has made, so Bothans, Noghri, Vong, etc. are all ok, and of course you can make something up. I made a Xi Charrian. If you didn't read Labyrinth of Evil, the Xi Charrians were a race of religously motivated engineers that created many war droid designs, such as the Vulture Droids from TPM and ROTS. They actually modeled much of their designs after their own anatomy according to the book, so I tried to make it look like a organic version of the Vulture Droids, but with a bti of variation. Wow. I really like that design. I would have never though to use that base figure in that way. The only thing I would do is adjust the hands so they are flat to the ground. Very creative. Thats a very cool looking alien. It toom me a while to figure out what that body base was - very nicely done! thanks guys ya it actually would look pretty cool if i made the hands lay flat, but then again the vulture droids walk on their pointed wings so i may leave it. I dont know what do you guys think? 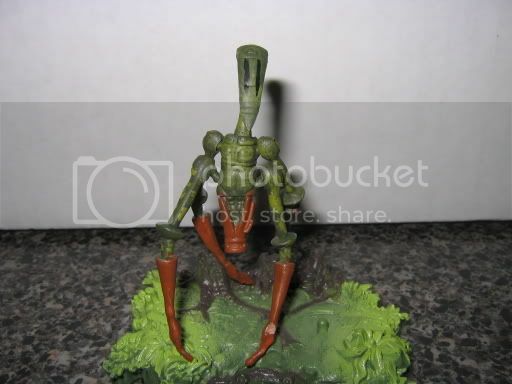 You could sand down the hands so they look more like stalks - like spider legs? Then again, how can you be an engineer without opposable thumbs? This is so freakin' cool, though. I am *thoroughly* impressed with your level of sheer creativity. I really, *really* want one of these now. 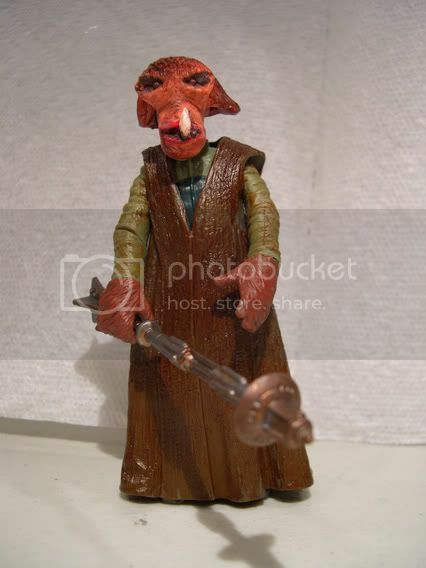 I started on my Kaleesh warrior named Qymaen Jai Sheelal AKA General Grievous. I'm doing his charecter before he is transformed into a cyborg. I dremeled out a Grievous head to get his Mumuu skull mask which is his face plate on his cyborg body. here is what he looked like before. Edited for name: Semel Odon. 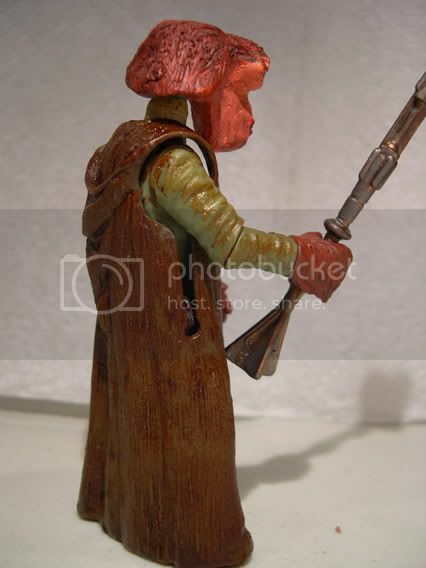 He is a hermit that lives on Tatooine. His species is the Shenzeeder. Looks good, brents for your first sculpt it looks great,alot better than my first. I'd suggest a smaller robe becasue that one looks a little big. Besides that he looks pretty good. Thanks for the comments. I've actually been sculpting things for a little while (mostly trying helmets and other things). However this was my first attempt something more "organic". I've gotten comments form two people about the robes so maybe they are off a little. However, I really liked this robe. Maybe it does look a little big but I needed something to cover up the body as it didn't work for the look I was going for. I wasn't trying to match the arms and "robe" its more like a sleeveless coverall. That looks so much better now that it is painted. I would suggest loosing the tooth. It looks strange there all by itself. Maybe two would be better. Phruby, glad you like the painted improvemtents. I'm not sure what do about the uni-tooth. I may look at it closer and see if I can add another one. Damn!!! Everyone is making such great stuff, and I havent even started yet. I absolutely love the Xi Charrian. I may have to swipe this idea later, I loved the concept in the book. I loke the look of BrentS's entry too. When I first saw the head sculpt I wasnt sure where he was going with it, but it came out looking pretty good. Phrubys is just priceless. Imagine a whole planet of blue haired, animal eared Animae characters. ( Shudder!!) The Xyber 9 body and hands were a great choice. The over large glove kind of reminds me of Hellboy. Let me add in that I really, really like your alien. He's very different from what we've seen before, and the parts you used to flesh out his design actually explain his look. Your use of him in the preview shots was awesome as well. Props for the high degree of creativity and the excellent execution here.